That disappointment you have been trying to avoid bringing into the light. Thinking that if you don’t look at it, it won’t hurt as much. Harbouring our hurts only deepens them. I have struggled with many disappointments over the years, and I have discovered the truth: each disappointment is the opportunity for a divine appointment. Have you been praying for something you hold dear, and it hasn’t happened yet? Did someone you love let you down, again? Has it been x number of years since your last raise? Did you get passed over for promotion? Has your significant other broken up with you? Did your loved one die even though you had been praying for their healing? Have your womb and arms remained empty despite your petitions? Last night, He reminded me in my LifeGroup that what matters to us, matters to Him. Money has been tight for the past few years. Surgeries & schooling, unexpected car repairs & time off work without any raises can leave you frustrated. I had been praying for increase, however God wants to bless us with it, and not seen almost any fruit in quite some time. All our needs are covered, except my desire to be debt free. We were invited to pray what was on our hearts during LifeGroup, and as I had already stepped our on Sunday to ask people to join me in praying for something related but equally important, I decided to not speak up about that need, and my disappointment it hasn’t yet come to pass. Imagine my shock when God prophetically spoke that exact request through the leader a few moments later. Increase is coming. God has a way of reminding us we can always bring what is bothering us to Him, doesn’t He? He has never informed me that what was on my heart was insignificant when I brought it before Him. He has always welcomed me with open arms, heard me out and loved up on me wherever I was at. Whether I share my joys, pain, hurts, grief, or blessings. Every disappointment I experience can lead to my experiencing God in a deeper way, if I not only bring it to Him, but give it to Him. 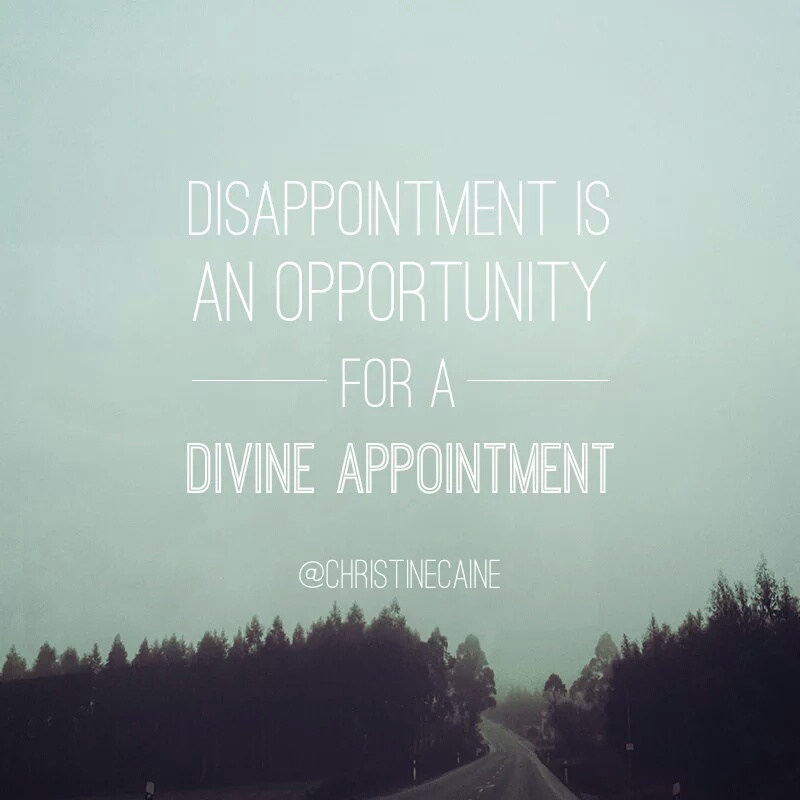 We experience divine appointment in exchange for our disappointment. As I stop typing and move on to spending some time with Him this morning, I will close by leaving you with one of my favorite passages to claim when I am struggling with loss or disappointment, when the road ahead is unclear. May He meet you right where your disappointments are, as you bring them into the light of His Presence. May He comfort & strengthen you too, as you draw near, and remind you of the blessings He has in store for you.